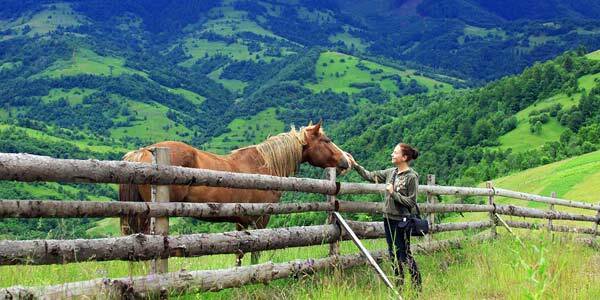 Discover Pip Ivan Observatory in the Carpathians as fast and comfortably as possible. 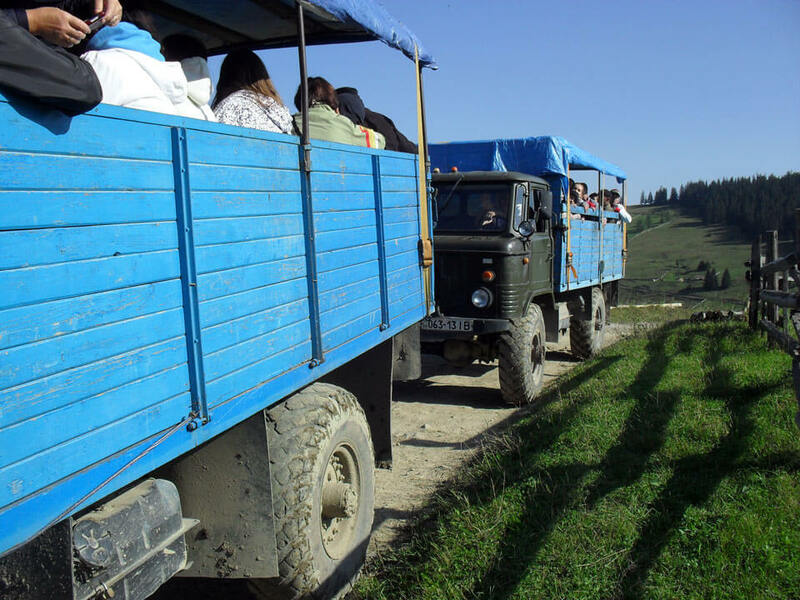 With our jeep tour it is possible within only one day without having to hike! Available for groups of up to 40 people and single travellers. It’s especially convenient if you are limited with time or you just prefer not to climb on foot. 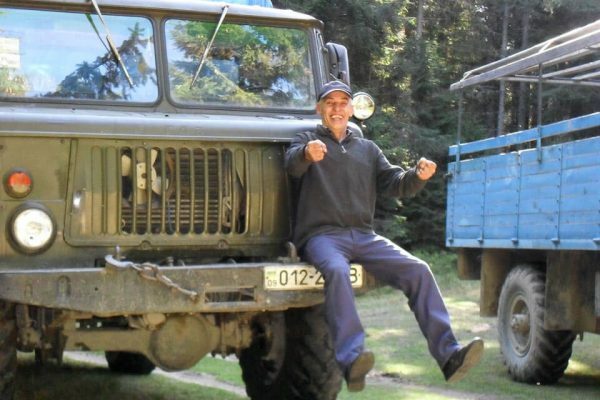 We use the GAZ 66 – a Soviet 4×4 all-road (off-road) military truck. 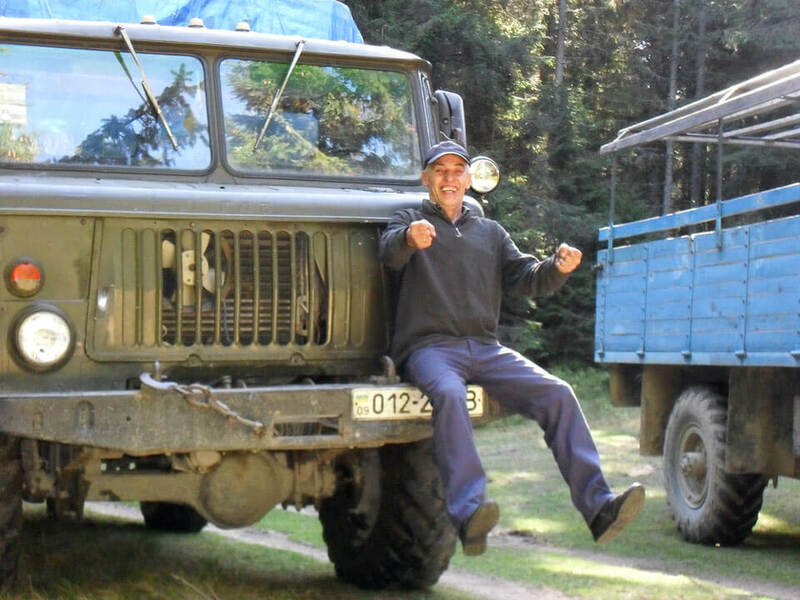 It was one of the main cargo vehicles for motorized infantry of the Soviet Army and is still employed in former Soviet Union countries. The GAZ-66 has gained legendary status in many countries around the world due to its reliability, simplicity and off-road capability. 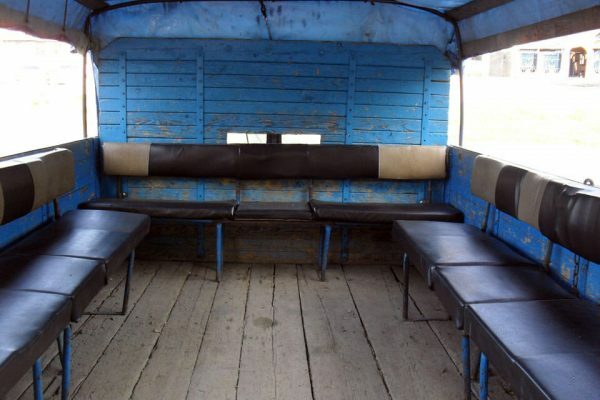 One vehicle fits up to 20 passengers. 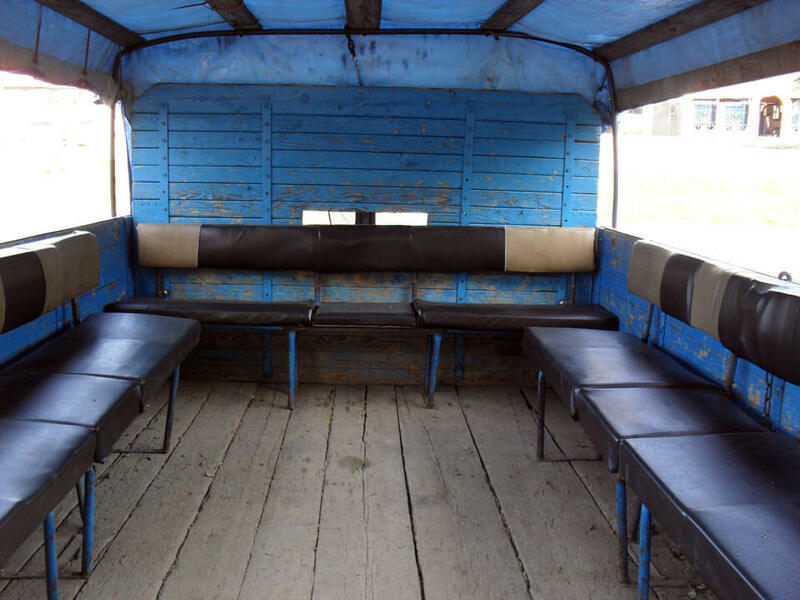 We have two GAZ 66 available (just what you need for your stag or hen party). Minimum number of participants is 1 person. Maximum – 40 tourists. Be sure to take your passport with you. There will be a border control (standard check). 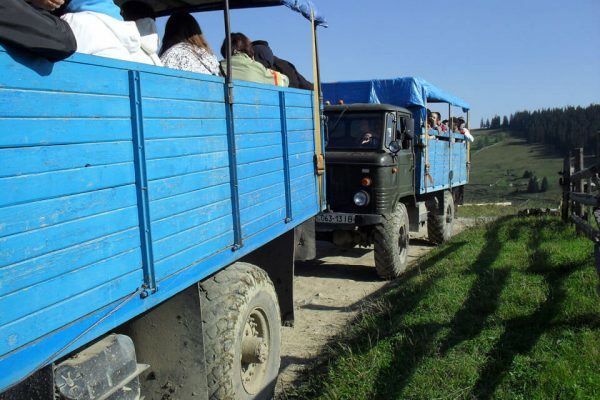 The Romanian border is only in few kilometers away. Former Polish Astronomical and Meteorological Observatory named after Józef Piłsudski of the Polish Airborne and Antigas Defence League, also known as the White Elephant. 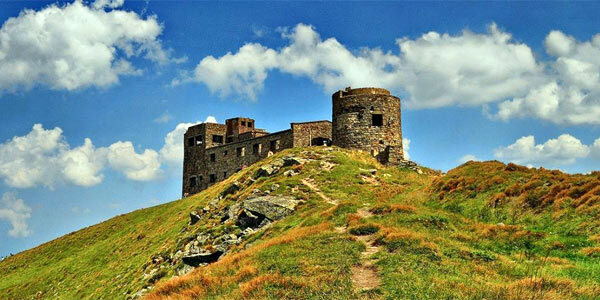 The highest located building in Ukraine in which people have always lived and worked. Built in 1938 by the University of Warsaw for the purpose of conducting astronomical and meteorological observations for the needs of aviation. 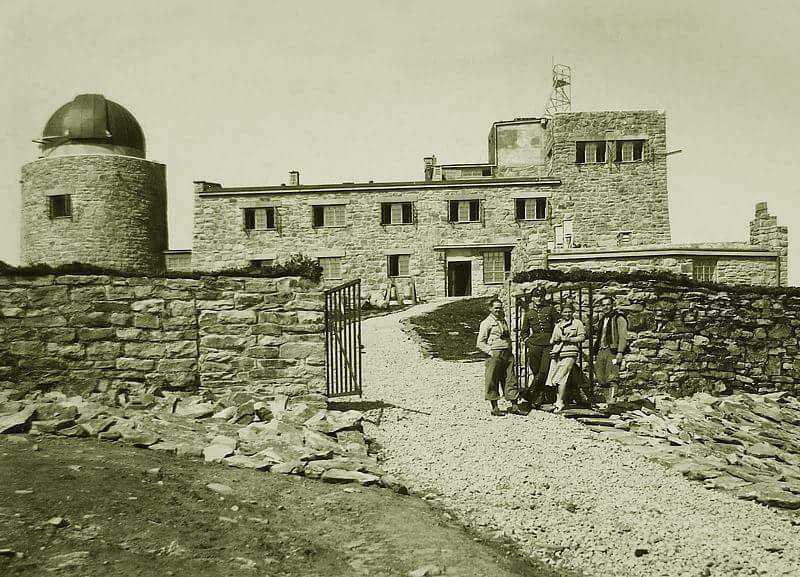 At present, a joint Ukrainian-Polish project is under way to restore the observatory, whose main task is to prepare the building for use as a station for a search and rescue unit, a research base for environmental monitoring, as a meteorological and seismological base, as well as an educational and research center for students. Flora. 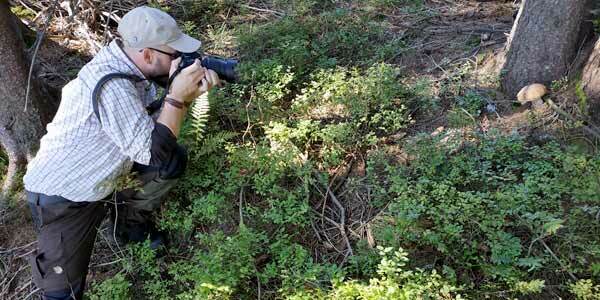 There are populations of many rare species of plants. Among them Ranunculus carpaticus, Primula vulgaris, Gentiana laciniata, Dracocephalum austriacum, Festuca porcii, Pulsatilla alba and Aconitum jacquinii. Significant areas along the route have blueberries and cranberries, overgrown mountain pine and rhododendron. 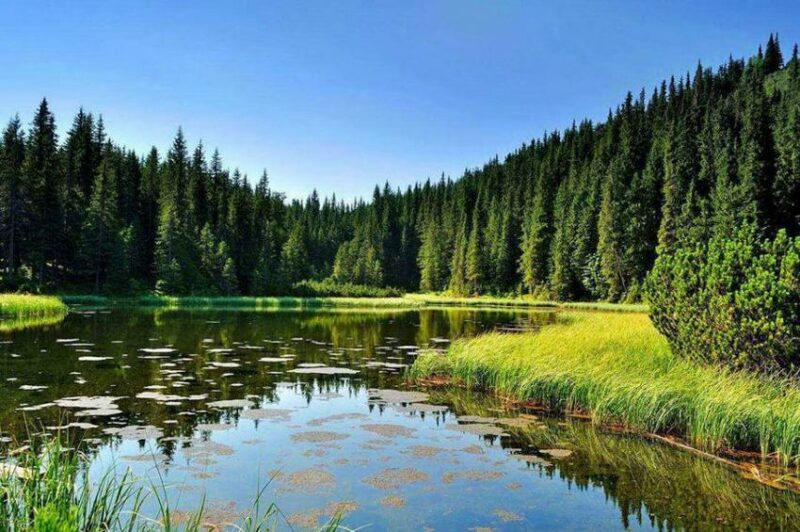 In the reservoirs that surround the path, there is an interesting range of amphibians – Carpathian newt (Lissotriton montandoni) and alpine newt (Ichthyosaura alpestris). Typical birds of Pip Ivan area are Grey wagtail (Motacilla cinerea) and white-throated dipper (Cinclus cinclus). In addition, you can see Eurasian jay, woodpecker, common rock thrush (Monticola saxatilis) and lesser spotted eagle (Clanga pomarina). Rare species: peregrine falcon (Falco peregrinus) and golden eagle (Aquila chrysaetos). Mammals of this territory are represented by predators, which feed on small kinds of aquatic fauna. These are Eurasian river otter, European mink and stoat. In the forests you can find red deer, western roe deer, wild boar, marten, Carpathian squirrel (Sciurus vulgaris carpathicus) and forest dormouse (Dryomys nitedula). Forests. A beech-fir-spruce forest with a few sycamores. At an altitude of 1500 m – mountain pine. Mountains. In the north-east we see the face of Smotrych mountain and Chornogora ridge. The ranges of the mountains of the Romanian Carpathians can be seen on the southwest and Chyvchyn mountains. 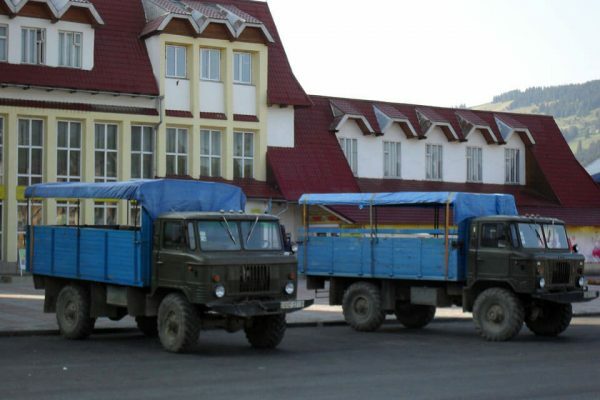 Border control in Shybene village may take up to 2 hours (depending on the size of the group). You must have a passport with you (otherwise, you will not be allowed to cross the border). 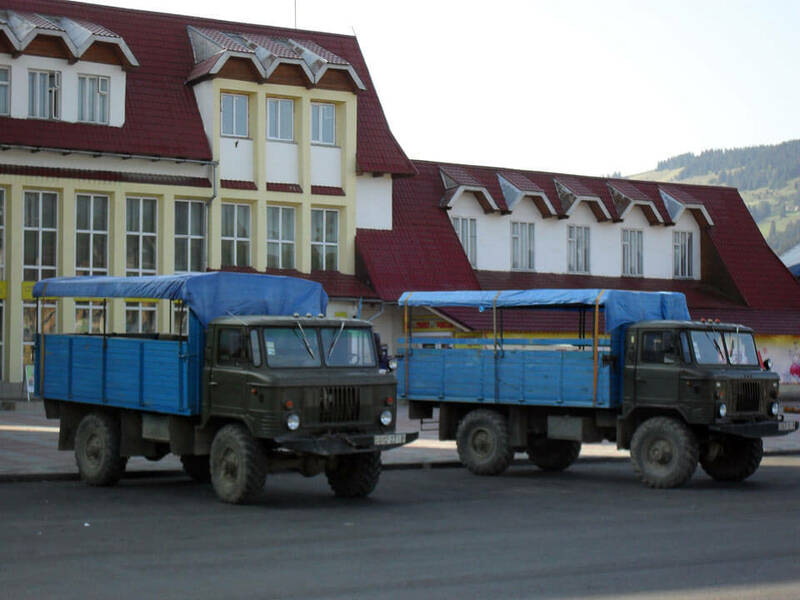 We will be at an altitude of 880 m above sea level and pass the Chornogirske Environmental Research Branch. There will be a steep climb of about 3 km to the polonyna (mountain valley), lasting 1.5 hours. There will be a place with many stones where all passengers will have to get out and walk for 100 meters. 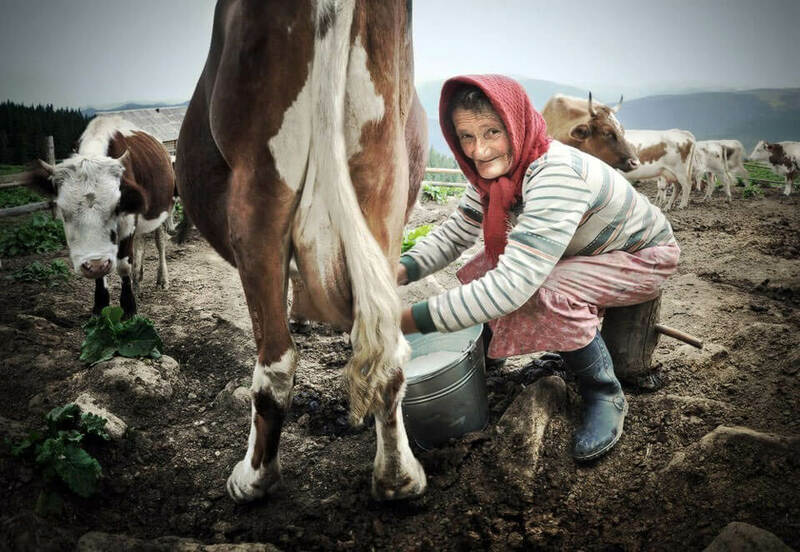 When we reach Vesnarka mountain valley there’s a traditional dairy farm and fresh water – your perfect chance to see how local people make cheese. We can have lunch here (or a little bit later, next to the lake). After another steep climb (you’ll have to get out of the vehicle again), we get to the Maricheyka lake (a Carpathian alpine lake, 1510 m above sea level). This is the other place where we can have a lunch. At present, the Observatory is closed to vehicles, so you will need to walk the last kilometre. It’s easy. We reach the Pip Ivan Chornogirsky (2024 MASL) – the Polish Astronomical and Meteorological Observatory – a unique monument of history and architecture of Ukraine. 1-1.5 hours – exploring the Observatory, taking pictures, having a rest. Road back to Verkhovyna (we use the same route). Estimated time of arrival: 6:00 PM – 8:00 PM. Meeting of the group in Verkhovyna (we arrange transfer if necessary). The latest time to start the tour is 11:00 AM. The road to Shybene village will take us about 1.5 hours. 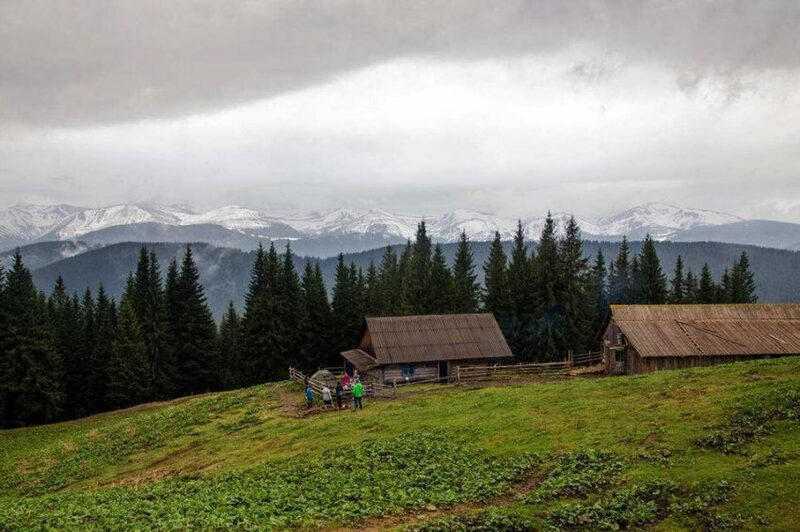 On our way you will see some remote Carpathian villages: Krasnyk, Topilche, Zelene and Yavirnyk. At an altitude of 880 m above sea level, we will pass the Chornogirske Environmental Research Branch. A steep climb of 3 kim to the polonyna (mountain valley) Vesnarka, lasting 1.5 hours. There will be a place with many stones. All passengers will have to get out and walk 100 meters. We reach Vesnarka mountain valley. 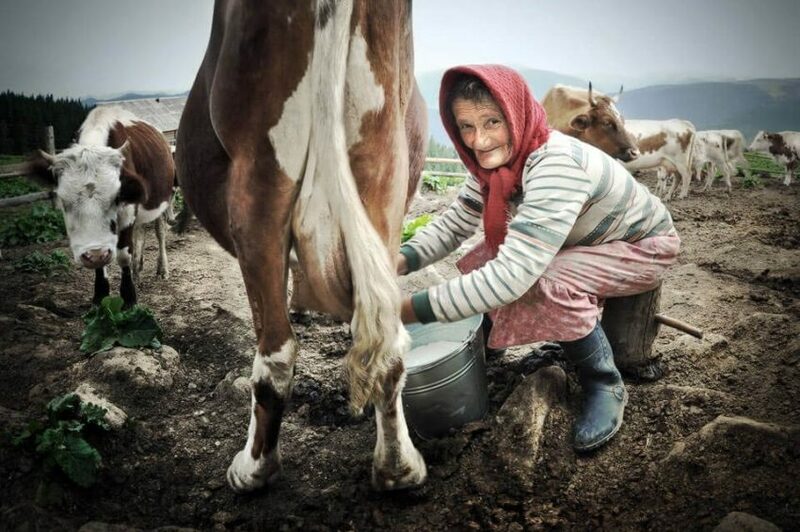 There’s a traditional dairy farm and fresh water. Your perfect chance to see how local people make cheese. We can have lunch here (or a little bit later, next to the lake). Another steep climb (you’ll have to get out of the car again). When we get to the Maricheyka lake (a Carpathian alpine lake, 1510 m above sea level), there is another place where we can have lunch. Lunch – 1 hour (bread, cheese, sausage, fish, vegetables). At present, the Observatory is closed to vehicles. You will have to walk the last kilometre. It’s easy. Options for overnight stay: Maricheyka lake (tents or hunting cabin) or Vesnarka dairy farm. You will need a sleeping bag (we can provide if necessary). Dinner. There will be local snacks and moonshine to try, before a good night’s sleep. Road back to Verkhovyna (we use the same route). waterproof jacket/trousers. In the mountains, the weather might change very quickly and often, or even rain all the time! a sleeping bag (we can arrange it if you don’t have).